After days of searching, which were starting to stretch into weeks, I was beginning to lose hope. I had put the word out with the local animal control and missing pet boards. My partner and I knocked on doors and wandered the neighborhood nightly, calling his name, but found no sign of him at all. In my heart I knew Merlin was still out there. As the second week of his absence came to a close, I had to do something more. I asked my Tarot deck where I would find him, or when he would come home, but with such strong and clouded emotion I could not get a clear read. It had been two weeks since Merlin went missing. He is not a hunter, and it had been raining hard for days at this point. I was willing to try anything! I then began to research energetic methods to find a lost a pet. This is when I found a meditation called The Golden Thread, or The Golden Cord. The meditation is a simple visualization technique, which allows one to connect energetically with your pet. Once the connection is established the idea is to communicate reassurance to the pet and encourage them to find their way home. You do this often throughout the day, to keep the connection open and to strengthen it. The first day I did the meditation, I felt strong reassurance that Merlin was uninjured and close-by. The second day was similar, but Merlin hadn’t come home yet, and I wasn’t sure if this meditation was going to work. I also had to be vigilant not to allow my own fears to travel through the cord to Merlin. In this way the meditation also helped me to be mindful of my own thoughts and feelings, and place my energetic focus on him coming home. On the third day I received a call from our neighbor downstairs. “Hey, we found your cat,” she said. I stuttered. “My cat? Which one,” thinking maybe Francis had now also escaped. I just couldn’t believe they had found Merlin, and any false hope would have been crushing at this point. “The grey one,” she said. Sure enough, they had discovered Merlin at the front of the house! He was not hiding, but walking around the house looking for a way in. I was stunned. And thrilled! He had managed to find his way back home. Once back inside and calmed down, Merlin looked at me and I saw something in his eyes I hadn’t before – a comprehension, a communication without the need for words. I felt his energy through the ‘golden cord,’ which by this time was so strong it felt like a warm glow in my chest. He knew and he felt it too. It was a profound moment. Since that time I have continued to practice the golden thread meditation, in order to communicate with both Francis and Merlin. I’ve been amazed at their response to this practice, and my own as well. I’ve always regarded my pets as being my companions or friends, rather than my subservient ‘animals.’ Exploring this facet of psychic connection has made them even more meaningful and beloved. I certainly sense that my pets are also loving the extra attention and energetic acknowledgement! As our pets, animals rely on us for food and shelter, but at their base they are beings with thoughts and feelings all their own. Anyone who is a pet a owner knows that animals have distinct personalities. They are individuals and when we regard them as equal to us in this way, we honor the Spirit with them. If your pet looks at you as you are observing them, make eye contact and focus on the feelings on love you have for them. Animals are sensitive to energy, and our pets are particularly attuned to ours. I encourage anyone who is wanting to get more in touch with their companion animal to try the same meditation technique. The first step to connecting with your pet is simply to watch and observe them. What does their body language, or expression say? Try to ‘feel’ into this observation as you would with any other loved one. Put aside the fact they are an ‘animal’ and really recognize them as they truly are – a soul. The next step is to visualize a ball of golden light in your heart. This golden light is filled with the intense love you feel for your pet. 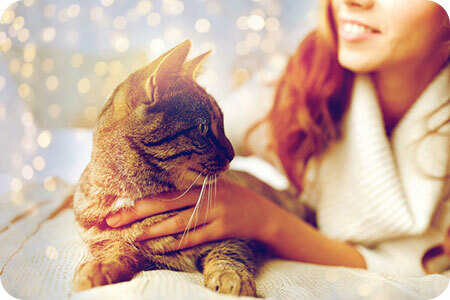 Feel the warmth inside you, as you focus on the things you love most about your pet. Then visualize a similar ball of light in your pets heart, with a golden cord connecting these two beautifully glowing orbs of love. Creative visualization works very well when working with animals in this way. Visualize in your mind the message you wish to send to your pet. Start with simple concepts at first. For example, you can visualize giving your pet affection and then ‘send’ this image to them through the golden cord. Request that they come to you, but do so energetically, or through your visualizations. This does take practice at first, and consistency. Once your pet realizes you have opened a means of communication, they are likely to take notice! That said, it should be noted that some pets, such as cats may acknowledge your request and decline it, so try not to get discouraged by this behavior. In the case of a lost pet, at this point you can send reassuring images and feelings of love and courage through this cord. Reassure you pet you are searching for them, and that they can find their way. Encourage them to follow the ‘golden thread’ back to you. This does not always manifest as the pet actually following the golden thread physically, but following the path to find their way home. Sometimes this is directly, sometimes it may be through other people, or circumstances. The Universe is magical like that. The more you practice communicating with your pet on an energetic level, the more your connection will develop. It is incredibly rewarding to feel such kinship with our animal friends, and I encourage all pet owners to give this a try.